PS3 at HKG? ORLY? ZOMG! 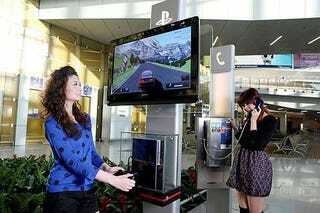 Well, this is a nice thing that Sony and Hong Kong International Airport have done: there are now 14 PS3 "Game Poles" (read: kiosks) distributed throughout the airport for travelers who've exhausted the entertainment potential of the Duty Free shop. Curiously, the games that they've chosen to provide—like Final Fantasy XIII, Avatar, and Uncharted 2—have the kind of long story arcs that don't exactly lend themselves to a two-hour delay. But hey, that's probably the point! The first hit's free, etc.